Amethyst Sparkle Purple Wings with purple glitter detailing that outlines the shape of the wings with silver decorative detailing. 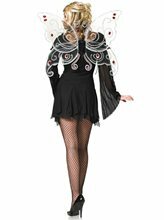 Jeweled Butterfly Fairy Wings costume includes sheer organza butterfly wings with red jewels and glitter accents. 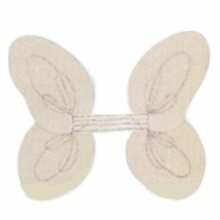 Complete your fairy pixie costume with these Iridescent Pixie Wings featuring iridescent wings with green and white ribbon detailing. 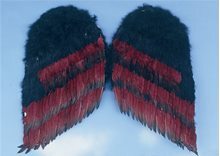 Butterfly Shimmer Adult Wings.Includes: Sheer black wings with curly tendrils.Available Size: One Size Fits Most Adults and Teens.Available Color: Black. *Costume and Other Accessories Not Included. 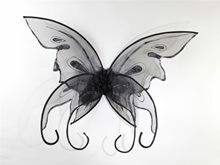 Sold Separately.Complete your fairy costume with these beautiful, spakling sheer black wings with curly tendrils! 20in Angel Wings.Includes: One Pair of 20in Angel Wings. Available Size: One Size Fits Most Children. *Costume and Accessories Not Included. Sold Separately. 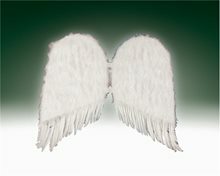 Angel's Chiffon Wings, approximately 20 inches. The wings are white chiffon even though the picture looks non-white. Silver glitter accents. One size fits all children. 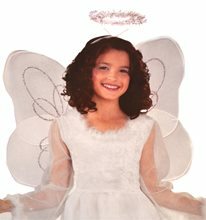 Marabou Angel Child Wings and Halo Set.Includes: One Pair of Angel Wings and Halo. Available Size: One Size Fits Most Children. *Costume and Accessories Not Included. Sold Separately.She'll be the perfect little angel in this wing and halo set. 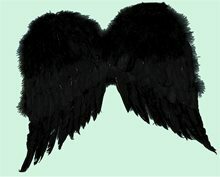 She'll steal the show with these marabou lined angel wings and tinsel trimmed halo. 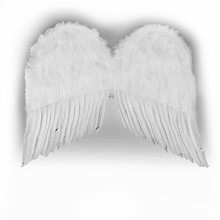 This is the perfect set for any angel costume.